A 24-year-old female presented to the emergency department of our hospital with chief complaints of a severe headache and projectile vomiting for 3 days. There was no history of fever, convulsions, or any focal neurological deficit. She was treated outside symptomatically but with no relief. On admission in our hospital, the patient was provisionally diagnosed with metabolic encephalopathy and was put on symptomatic treatment. However, she was transferred to intensive care unit when she deteriorated further developing altered sensorium (Glasgow Coma Scale-9) and high-grade fever with chills. Investigations revealed dyselectrolytemia (serum potassium – 3.7 mEq/L). Other blood investigations revealed low serum phosphate (1.57 mg/dL) and neutrophilic leukocytosis (total leukocyte count – 24,170/μl with neutrophils – 91%). Cerebrospinal fluid (CSF) was sent for evaluation before the patient was empirically treated with ceftriaxone. Gram stain of the centrifuged deposit of CSF revealed both polymorphs and lymphocytes with Gram-positive bacilli [Figure 1]. Culture of CSF [Figure 2] grew Listeria monocytogenes identified by both conventional [Table 1] and automated methods (VITEK-2, Biomerieux). 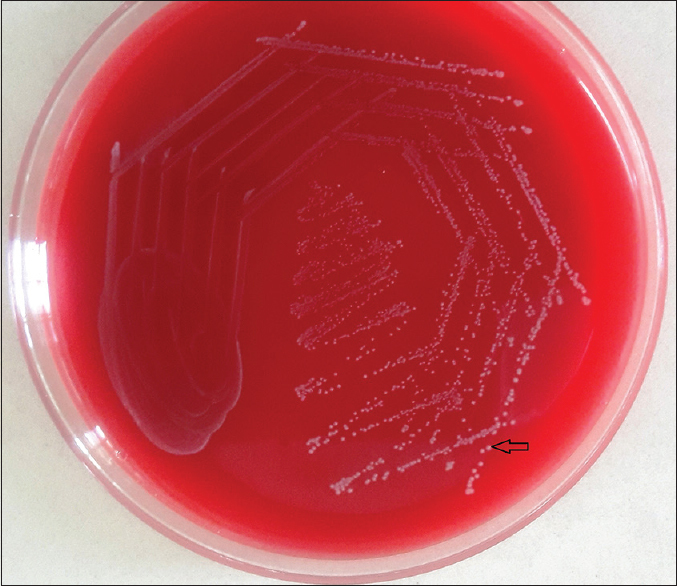 The blood culture taken at admission had grown Gram-positive bacilli and was ignored as diphtheroids; and now on reevaluation, was recognized as L. monocytogenes with similar sensitivity pattern. The patient was switched to meropenem as per the susceptibility pattern along with other corrective measures with which she showed clinical and microbiological improvement. L. monocytogenes, a Gram-positive, aerobic, intracellular pathogen, in India is usually limited to sporadic case reports including listeriosis during pregnancy, sepsis and meningitis in newborns, acute febrile gastroenteritis and invasive disease in foodborne outbreaks, and fatal disseminated infections in immunocompromised hosts., Unusual localized infections such as pneumonia, hepatitis, arthritis, and endophthalmitis have also been reported in the literature. It is the third most common cause of bacterial meningitis but is seen only in 6% of cases. 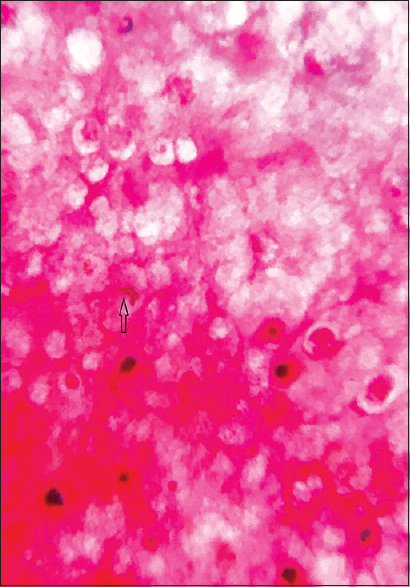 Meningitis due to L. monocytogenes is described as a disease of immunocompromised patients and those of extreme age groups and is generally associated with high case fatality rates (24%–62%). However, our patient was a healthy young female, and a thorough evaluation did not reveal any preexisting illness or any prolonged medication which could have contributed to listerial meningitis. Similar anecdotal reports of meningitis by L. monocytogenes in young healthy adults have also been reported. Again meningitis by Listeria, as in our case, presents with atypical symptoms such as lower incidence of meningeal signs and dyselectrolytemia,, thus creating a dilemma in diagnosis. 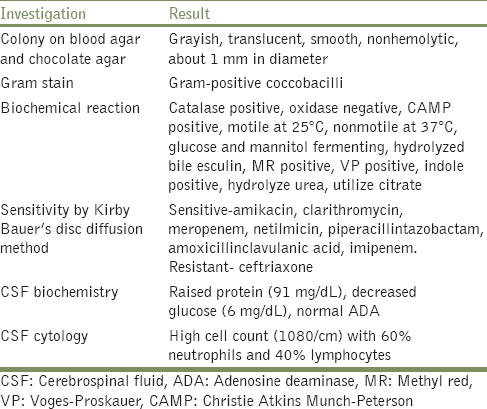 Microbiological diagnosis is important as L. monocytogenes is inherently resistant to cephalosporin and vancomycin commonly used as an empiric regimen for meningitis. However, the identification is challenging as the organism on Gram stain occurs singly or in pairs which are angled at point of contact resembling diphtheroids or diplococci and may thus be discarded as a contaminant. Thus, possibility of listerial infection in young healthy adults cannot be ruled out. A careful microbiological identification is a key component of proper diagnosis and treatment. Goulet V, Marchetti P. Listeriosis in 225 non-pregnant patients in 1992: Clinical aspects and outcome in relation to predisposing conditions. Scand J Infect Dis 1996;28:367-74. Siegman-Igra Y, Levin R, Weinberger M, Golan Y, Schwartz D, Samra Z, et al. Listeria monocytogenes infection in Israel and review of cases worldwide. Emerg Infect Dis 2002;8:305-10. Koopmans MM, Brouwer MC, Bijlsma MW, Bovenkerk S, Keijzers W, van der Ende A, et al. Listeria monocytogenes sequence type 6 and increased rate of unfavorable outcome in meningitis: Epidemiologic cohort study. Clin Infect Dis 2013;57:247-53. Schlech WF 3rd, Ward JI, Band JD, Hightower A, Fraser DW, Broome CV, et al. Bacterial meningitis in the United States, 1978 through 1981. The national bacterial meningitis surveillance study. JAMA 1985;253:1749-54. Mylonakis E, Hohmann EL, Calderwood SB. Central nervous system infection with Listeria monocytogenes 33 years' experience at a general hospital and review of 776 episodes from the literature. Medicine (Baltimore) 1998;77:313-36. Lorber B. Listeriosis. Clin Infect Dis 1997;24:1-9.